Pedestrian zones (also known as auto-free zones and car-free zones, and as pedestrian precincts in British English) are areas of a city or town reserved for pedestrian-only use and in which most or all automobile traffic may be prohibited. Converting a street or an area to pedestrian-only use is called pedestrianisation. Pedestrianisation usually aims to provide better accessibility and mobility for pedestrians, to enhance the volume of shopping and other business activity in the area and/or to improve the attractiveness of the local environment in terms of aesthetics, air pollution, noise and crash involving motor vehicle with pedestrians. However, pedestrianisation can sometimes lead to reductions in business activity, property devaluation, and displacement of economic activity to other areas. In some cases traffic in surrounding areas may increase, due to displacement rather than substitution of car traffic. Nonetheless, pedestrianisation schemes are often associated with significant drops in local air and noise pollution, accidents, and frequently with increased retail turnover and increased property values locally. A car-free development generally implies a large scale pedestrianised area that relies on modes of transport other than the car, while pedestrian zones may vary in size from a single square to entire districts, but with highly variable degrees of dependence on cars for their broader transport links. Pedestrian zones have a great variety of approaches to human-powered vehicles such as bicycles, inline skates, skateboards and kick scooters. Some have a total ban on anything with wheels, others ban certain categories, others segregate the human-powered wheels from foot traffic, and others still have no rules at all. Many Middle Eastern kasbahs have no wheeled traffic, but use donkey-driven or hand-driven carts for freight transport. The idea of separating pedestrians from wheeled traffic is an old one, dating back at least to the Renaissance. However, the earliest modern implementation of the idea in cities seems to date from about 1800, when the first covered shopping arcade was opened in Paris. 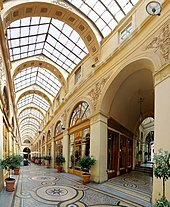 Separated shopping arcades were constructed throughout Europe in the 19th century, precursors of modern shopping malls. A number of architects and city planners, including Joseph Paxton, Ebenezer Howard, and Clarence Stein, in the 19th and early 20th centuries proposed plans to separate pedestrians from traffic in various new developments. The first "pedestrianisation" of an existing street seems to have taken place "around 1929" in Essen, Germany. This was in Limbecker Straße, a very narrow shopping street that could not accommodate both vehicular and pedestrian traffic. Two other German cities followed this model in the early 1930s, but the idea was not seen outside Germany. Following the devastation of the Second World War a number of European cities implemented plans to pedestrianise city streets, although usually on a largely ad hoc basis, through the early 1950s, with little landscaping or planning. By 1955 twenty-one German cities had closed at least one street to traffic, although only four were "true" pedestrian streets, designed for the purpose. At this time pedestrianisation was not seen as a traffic restraint policy, but rather as a complement[clarification needed] to customers who would arrive by car in a city centre. Pedestrianisation was also common in the United States during the 1950s and 60s as downtown businesses attempted to compete with new suburban shopping malls. However, most of these initiatives were not successful in the long term, and about 90% have been changed back to motorised areas. Marktplatz in Karlsruhe, Germany, coexists with a tramline. A car-free zone is different from a typical pedestrian zone, in that it implies a development largely predicated on modes of transport other than the car. A pedestrian zone may be much more limited in scope, for example a single square or street being for pedestrians, but largely serviced by cars. Venice, which occupies many islands in a lagoon, divided by and accessed from canals. The city has been car-free for more than three decades. Motor traffic stops at the car park at the head of the viaduct from the mainland, and water transport or walking takes over from there. However, motor vehicles are allowed on the nearby Lido. The Old Town of Rhodes, where many, if not most, of the streets are too steep and/or narrow for car traffic. Mount Athos, an autonomous monastic state under the sovereignty of Greece, does not permit automobiles on its territory. Trucks and work-related vehicles only are in use there. The medieval city of Mdina in Malta does not allow automobiles past the city walls. It is known as the "Silent City" because of the absence of motor traffic in the city. Sark, an island in the English Channel, is a car-free zone where only bicycles, carriages and tractors are used as transportation. To assist with transport from the car parks in at the edge of car-free cities, there are often bus stations, bicycle sharing stations, and the like. The term car-free development implies a physical change: either new building or changes to an existing built area. Are designed to enable residents to live without owning a car. The city centre of Jyväskylä in Finland is pedestrianised. Whereas the first two models apply to newly-built car-free developments, most pedestrianised city, town and district centres have been retro-fitted. Pedestrianised centres may be considered car-free developments where they include a significant number of residents, mostly without cars, due to new residential development within them, or because they already included dwellings when they were pedestrianised. The largest example in Europe is Groningen, with a city centre population of 16,500. Several studies have been carried out on European carfree developments. The most comprehensive was conducted in 2000 by Jan Scheurer. Other more recent studies have been made of specific car-free areas such as Vienna's Floridsdorf car-free development. The main problems related to parking management. Where parking is not controlled in the surrounding area, this often results in complaints from neighbours about overspill parking. There were calls for traffic to be reinstated in Trafalgar Square, London, after pedestrianisation caused noise nuisance for visitors to the National Gallery. The director of the gallery is reported to have blamed pedestrianization for the "trashing of a civic space". Local shopkeepers may be critical of the effect of pedestrianization on their businesses. Reduced through traffic can lead to fewer customers using local businesses, depending on the environment and the area's dependence on the through traffic. The first purpose-built pedestrian street in Europe is the Lijnbaan in Rotterdam, opened in 1953. The first pedestrianised shopping centre in the United Kingdom was in Stevenage in 1959. A large number of European towns and cities have made part of their centres car-free since the early 1960s. These are often accompanied by car parks on the edge of the pedestrianised zone, and, in the larger cases, park and ride schemes. Central Copenhagen is one of the largest and oldest: it was converted from car traffic into a pedestrian zone in 1962 as an experiment, and is centered on Strøget, which is not a single street but a series of interconnected avenues which create a very large pedestrian zone, although it is crossed in places by streets with vehicular traffic. Most of these zones allow delivery trucks to service the businesses there during the early morning, and street-cleaning vehicles will usually go through these streets after most shops have closed for the night. A number of German islands ban or strictly limit the private use of motor vehicles. Heligoland, Hiddensee, and all but two of the East Frisian islands are car-free; Borkum and Norderney have car-free zones and strictly limit automobile use during the summer season and in certain areas, also forbidding travel at night. Some areas provide exceptions for police and emergency vehicles; Heligoland also bans bicycles. In the early 1980s, the Alternative Liste für Demokratie und Umweltschutz (which later became part of Alliance 90/The Greens) unsuccessfully campaigned to make West Berlin a car-free zone. In North America, where a more commonly used term is pedestrian mall, such areas are still in their infancy. Few cities have pedestrian zones, but some have pedestrianized single streets. Some cities have transit malls. Many pedestrian streets are surfaced with cobblestones, or pavement bricks, thus discouraging any kind of wheeled traffic, including wheelchairs. They are rarely completely free of motor vehicles. Often, all of the cross streets are open to motorized traffic, which thus intrudes on the pedestrian flow at every street corner. In a few pedestrian streets with no cross street cars or trucks, deliveries are made by trucks by night. Some Canadian examples are the Sparks Street Mall area of Ottawa, the Distillery District in Toronto, Scarth Street Mall in Regina, Stephen Avenue Mall in Calgary (with certain areas open to parking for permit holders) and part of Prince Arthur Street and the Gay Village in Montreal. Algonquin and Ward's Islands, parts of the Toronto Islands group, are also car-free zones for all 700 residents. Since summer 2004, Toronto has also been experimenting with "Pedestrian Sundays" in its busy Kensington Market. Granville Mall in Halifax, Nova Scotia was a run-down section of buildings on Granville Street built in the 1840s that was restored in the late 1970s. The area was then closed off to vehicles. Cyclists enjoy the carfree highway (M-185) on Mackinac Island. In the United States, these zones are commonly called pedestrian malls or pedestrian streets. Pedestrian zones are rare in the United States, although some cities have created single pedestrian streets. Mackinac Island, between the upper and lower peninsulas of Michigan, banned horseless carriages in 1896, making it auto-free. The original ban still stands, except for emergency vehicles. Travel on the island is largely by foot, bicycle, or horse-drawn carriage. An 8-mile (13 km) road, M-185 rings the island, and numerous roads cover the interior. M-185 is the only highway in the United States without motorized vehicles. In 1959, Kalamazoo was the first American city to implement a "pedestrian mall" in its downtown core. This became a popular method for downtowns to compete with the growing suburban shopping malls of the time. In the 1960s and 70s over 200 towns in the United States adopted this approach. The idea of exclusive pedestrian zones lost popularity through the 1980s and into the 1990s. Downtown Crossing in Boston is a shopping district which prohibits automobiles during daytime hours. Both the main thoroughfare of Golden Gate Park in San Francisco, and Memorial Drive, a busy road in Cambridge, MA are closed to car traffic each Sunday during the summer to allow pedestrians, bikers, skateboarders and roller/inlineskaters an opportunity to use the road. A number of streets and malls in New York City are now pedestrian-only, including 6​1⁄2 Avenue, Fulton Street, parts of Broadway, and a block of 25th Street. Fire Island in Suffolk County, New York is pedestrianised east of the Fire Island Lighthouse and west of Smith Point County Park (with the exception of emergency vehicles). Supai, Arizona, located within the Havasupai Indian Reservation is entirely car-free, the only community in the United States where mail is still carried out by mule. Supai is located eight miles from the nearest road, and is accessible only by foot, horse/mule, or helicopter. State Street in Madison, Wisconsin is the largest pedestrian mall in Wisconsin and connects the University of Wisconsin to Capitol Square in Downtown Madison. The street houses some of Madison's oldest buildings and stores, as well as theaters such as the Orpheum and the Overture Center for the Arts. A portion of Third Street in Santa Monica, California was converted into a pedestrian mall in the 1960s to become what is now the Third Street Promenade, a very popular shopping district located just a few blocks from the beach and Santa Monica Pier. Lincoln Road in Miami Beach, which had previously been a shopping street with traffic, was converted into a pedestrian only street in 1960. The designer was Morris Lapidus. Lincoln Road Mall is now one of the main attractions in Miami Beach. 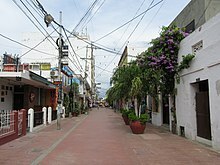 Playa del Carmen has a pedestrian mall, Quinta Avenida, ("Fifth Avenue") that stretches 4 kilometres (2.5 mi) and receives 4 million visitors annually with hundreds of shops and restaurants. Argentina's big cities; Córdoba, Mendoza and Rosario have lively pedestrianised street centers (Spanish: peatonales) combined with town squares and parks which are crowded with people walking at every hour of the day and night. Most (if not all) of Argentina's cities are human-scale and pedestrian-friendly, although vehicle traffic may be hectic in some areas. In Buenos Aires, some stretches of Calle Florida have been pedestrianised since 1913, which makes it one of the oldest car-free thoroughfares in the world today. Pedestrianised Florida, Lavalle and other streets contribute to a vibrant shopping and restaurant scene where street performers and tango dancers abound, streets are crossed with vehicular traffic at chamfered corners. Paquetá Island in Rio de Janeiro is auto-free. The only cars allowed on the island are police and ambulance vehicles. In Rio de Janeiro, the roads beside the beaches are auto-free on Sundays and holidays. Tumbacuatro Street in Santa Marta. Downtown Rio de Janeiro, Ouvidor Street, over almost its entire length, has been continually a pedestrian space since the mid-nineteenth century when not even carts or carriages were allowed. And the Saara District, also downtown, consists of some dozen or more blocks of colonial streets, off limits to cars, and crowded with daytime shoppers. Likewise, many of the city's hillside favelas are effectively pedestrian zones as the streets are too narrow and/or steep for automobiles. Eixo Rodoviário, in Brasília, which is 13 kilometers long and 30 meters wide and is an arterial road connecting the center of that city from both southward and northward wings of Brasília's Plano Piloto, perpendicular to the well known Eixo Monumental (Monumental Axis in English), is auto-free on Sundays and holidays. Rua XV de Novembro (15 November Street) in Curitiba is one of the first major pedestrian streets in Brazil. Chile has many large pedestrian streets. 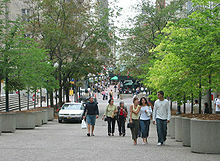 An example is Paseo Ahumada in Santiago and Calle Valparaíso in Viña del Mar. During his 1998–2001 term, the former Bogotá mayor, U.S.-born Enrique Peñalosa, created several pedestrian streets, plazas and bike paths integrated with a new bus rapid transit system. The historic center of Cartagena closes some streets to cars during certain hours. Santa Marta also has permanent pedestrian zones in the historic center around the Cathedral Basílica of Santa Marta. Jirón de La Unión in Lima is a traditional pedestrian street located in the Historic Centre of Lima, part of the capital of Peru. In the city of Arequipa, Mercaderes is also a considerably large pedestrian street. Also, recently three of the four streets surrounding the city`s main square or "Plaza de Armas" were also made pedestrian. Vehicles have been banned in the town of Matheran, in Maharashtra, India since the time it was discovered in 1854. Nanjing Road in Shanghai is perhaps the most well-known pedestrian zone in mainland China. Wangfujing is a famous tourist and retail oriented pedestrian zone in Beijing. Chunxilu in Chengdu is the most well known in western China. Dongmen is the busiest business zone in Shenzhen. Zhongyang Street is a historical large pedestrian street in Harbin. Sai Yeung Choi Street in Hong Kong. In Hong Kong, since 2000, the government has been implementing full-time or part-time pedestrian streets in a number of areas, including Causeway Bay, Central, Wan Chai, Mong Kok, and Tsim Sha Tsui. The most popular pedestrian street is Sai Yeung Choi Street. It was converted into a pedestrian street in 2003. From December 2008 to May 2009, there were three acid attacks during which corrosive liquids were placed in plastic bottles and thrown from the roof of apartments down onto the street. In India, a citizens’ initiative in Goa state, has made 18 June Road, Panjim’s main shopping boulevard a Non-Motorised Zone (NoMoZo). The road is converted into a NoMoZo for half a day on one Sunday every month. In Pune, Maharashtra, similar efforts have been made to convert M.G. Road (a.k.a. Main Street) into an open-air mall. The project in questioned aimed to create a so-called "Walking Plaza". Pedestrian zones in Japan are called hokōsha tengoku (歩行者天国, literally "pedestrian heaven"). Clis Road, in Sendai, Japan, is a covered pedestrian mall, as is Hondōri in Hiroshima. Several major streets in Tokyo are closed to vehicles during weekends. One particular temporary hokōsha tengoku in Akihabara was cancelled after the Akihabara massacre in which a man rammed a truck into the pedestrian traffic and subsequently stabbed more than 12 people. Insadong in Seoul, South Korea has a large pedestrian zone (Insadong-gil) during certain hours. Also in South Korea, in 2013, in the Haenggun-dong neighbourhood of Suwon, streets were closed to cars as a month-long car-free experiment while the city hosted the EcoMobility World Festival. Instead of cars, residents used non-motorized vehicles provided by the festival organizers. The experiment was not unopposed; however, on balance it was considered a success. Following the festival, the city embarked on discussions about adopting the practice on a permanent basis. Ximending in Taipei, Taiwan is a neighborhood and shopping district in the Wanhua District of Taipei, Taiwan. It was the first pedestrian zone in Taiwan. The district is very popular in Taiwan. In Thailand, some small streets (Soi) in Bangkok are designed to be all-time closed traffic, the city's famous shopping streets of Sampheng Lane in Chinatown and Wang Lang Market nearby to Siriraj Hospital, are the most popular for both local and tourists shopping streets. Additionally the city has built long skywalk systems. Walking Street, Pattaya is also closed to traffic. Night markets are routinely closed to auto traffic. Huế in Vietnam has made 3 roads into pedestrians-only on weekend nights. Also, Hanoi has opened an Old Quarter Walking Street on weekend nights. North Africa contains some of the largest auto-free areas in the world. Fes-al-Bali, a medina of Fes, Morocco, with its population of 156,000, may be the world's largest contiguous completely carfree area, and the medinas of Cairo, Tunis, Casablanca, Meknes, Essaouira, and Tangier are quite extensive. 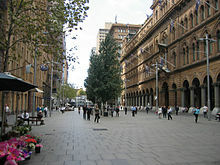 In Australia, as in the US, these zones are commonly called pedestrian malls and in most cases comprise only one street. Most pedestrian streets were created in the late 1970s and 1980s, the first being City Walk, Garema Place in Canberra in 1971. Of 58 pedestrian streets created in Australia in the last quarter of the 20th century, 48 remain today, ten having re-introduced car access between 1990 and 2004. 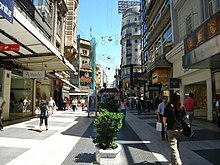 All capital cities in Australia have at least one pedestrian street of which most central are: Pitt Street Mall and Martin Place in Sydney, Bourke Street Mall in Melbourne, Queen Street Mall and Brunswick Street Mall in Brisbane, Rundle Mall in Adelaide, Hay Street and Murray Street Malls in Perth, Elizabeth Street Mall in Hobart, City Walk in Canberra, and Smith Street in Darwin. Many other mid-sized and regional Australian cities also feature pedestrian malls, examples include Langtree Avenue Mildura, Cavill Avenue Gold Coast, Bridge Street Ballarat, Nicholas Street Ipswich, Hargreaves Street Bendigo, Maude Street Shepparton and Little Mallop Street Geelong. Empircial studies by Jan Gehl indicate an increase of pedestrian traffic as result of public domain improvements in the centres of Melbourne with 39% increase between 1994-2004 and Perth with 13% increase between 1993-2009. Most intensive pedestrian traffic flows on a summer weekday have been recorded in Bourke Street Mall Melbourne with 81,000 pedestrians (2004), Rundle Mall Adelaide with 61,360 pedestrians (2002), Pitt Street Mall Sydney with 58,140 (2007) and Murray Street Mall Perth with 48,350 pedestrians (2009). Rottnest Island off Perth is car free, only allowing vehicles for essential services. Bicycles are the main form of transport on the island; they can be hired or brought over on the ferry. In Melbourne's north-eastern suburbs, there have been many proposals to make the Doncaster Hill development area a pedestrian zone. If the proposals are passed, the zone could be one of the largest in the world, by area. In New Zealand, it is becoming more common to use public transportation against cars, such as in Queenstown, a prominent pedestrianised area including multiple lanes and streets inside the main blocks. Queenstown Lakes District Council and affiliated groups including Destination Queenstown and Downtown Queenstown propose adding another stretch into a car free zone. This is continuing with large grassed settings along the full pedestrianised promenade. Auckland is also starting to pedestrianise malls and streets. Sign indicating the end of a small car-free zone in central Ripon in the United Kingdom. ^ "Pedestrian precinct - Definition, meaning & more - Collins Dictionary". Retrieved 23 July 2016. ^ a b c Chiquetto, Sergio (1997). "The Environmental Impacts from the Implementation of a Pedestrianization Scheme". Transportation Research Part D: Transport and Environment. 2 (2): 133–146. doi:10.1016/S1361-9209(96)00016-8. ^ Castillo-Manzano, José; Lourdes Lopez-Valpuesta; Juan P. Asencio-Flores (2014). "Extending pedestrianization processes outside the old city center; conflict and benefits in the case of the city of Seville". Habitat International. 44: 194–201. doi:10.1016/j.habitatint.2014.06.005. ^ a b c d e f Hall, Peter; Hass-Klau, Carmen (1985). Can Rail Save the City? The impacts of rapid transit and pedestrianisation on British and German cities. Aldershot: Gower Publishing. p. 83. ISBN 978-0566009471. ^ Hall, Peter; Hass-Klau, Carmen (1985). Can Rail Save the City? The impacts of rapid transit and pedestrianisation on British and German cities. Aldershot: Gower Publishing. p. 89. ISBN 978-0566009471. ^ Judge, Cole. "The Experiment of American Pedestrian Malls: Trends Analysis, Necessary Indicators for Success and Recommendations for Fresno's Fulton Mall" (PDF). Fresno Future. Retrieved 19 June 2016. ^ a b "WTPP Index - Main Index". Archived from the original on 12 January 2016. Retrieved 23 July 2016. ^  Gemeente Groningen, (2008) Statistisch Jaarboek. ^ Scheurer, J. (2001) Urban Ecology, Innovations in Housing Policy and the Future of Cities: Towards Sustainability in Neighbourhood CommunitiesThesis (PhD), Murdoch University Institute of Sustainable Transport. ^ Ornetzeder, M., Hertwich, E.G., Hubacek, K., Korytarova, K. and Haas, W. (2008) The environmental effect of car-free housing: A case in Vienna. Ecological Economics 65 (3), 516-530. 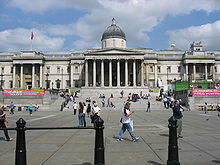 ^ "Trafalgar Square is being trashed, says gallery chief". London Evening Standard. ES London. 2009-07-10. Retrieved 2010-05-17. ^ "'They're going to ruin us with the pedestrianization'". WalesOnline. Media Wales. 2010-04-29. Retrieved 2010-05-17. ^ a b Robertson, Kent (1990). "The Status of Pedestrian Malls in American Downtowns". Urban Affairs Quarterly. 26 (2): 250–273. doi:10.1177/004208169002600206. ^ "Calle Mercaderes - Arequipa, Región Arequipa - Opiniones y fotos - TripAdvisor". Retrieved 23 July 2016. ^ "Arequipa: Hoy la plaza de armas es solo para los peatones". Retrieved 23 July 2016. ^ Dey, J (19 May 1999). "MMRDA questions council's new designs on Matheran". Mumbai: The Indian Express. Express News. Retrieved Aug 12, 2014. ^ "MG Road walking plaza will be back - The Times of India". Retrieved 23 July 2016. ^ Strother, Jason (30 September 2013). "Locals applaud car-free month in Korean city". Deutsche Welle. Retrieved 13 December 2013. ^ "Report presents legacy of car-free neighborhood". EcoMobility world Festival 2013. ICLEI. Retrieved 13 December 2013. This page was last edited on 4 March 2019, at 22:31 (UTC).